This is a collection of the Best Premium Church WordPress Themes specifically designed for the needs of churches, organizations and religious groups. 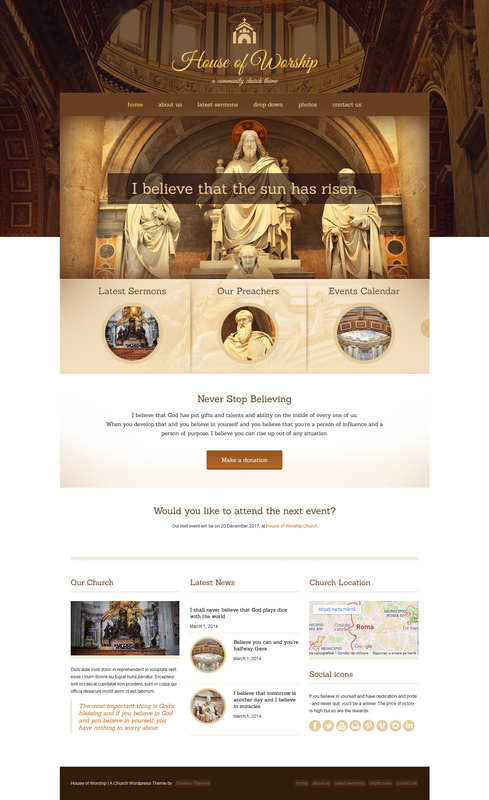 This is a showcase with the best church themes made for WordPress. Every church should have its own website because it’s a great way to create a strong online community around a church. Also, it helps to educate the churchgoers and keep them updated on the latest events. These themes are modern and attractive and helps people to know about the happenings at the Church and get more involved in the religious undertakings. All these themes are fully responsive and other essential functionality. These Premium Church WordPress Themes will definitely transform a standard WordPress blog into an professional looking church website. In this post, I am featuring a handpicked collection of the 10+ Best Premium Church WordPress Themes for making a modern and attractive website for your church or religious community, you will find the one that is suitable for you. Have a look. Hey Buddy!, I found this information for you: "10+ Best Premium Church WordPress Themes". Here is the website link: https://8degreethemes.com/blog/best-premium-church-wordpress-themes/. Thank you.